Every year I download less mp3's than the last. 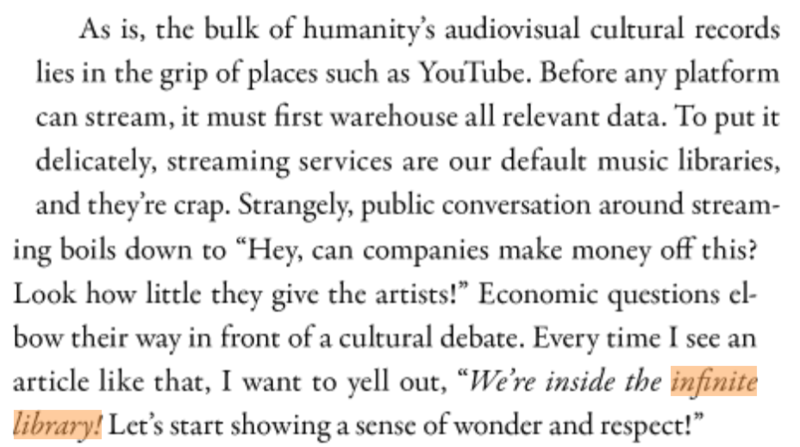 I think I used to feel political about this (downloading vs. streaming), but I've come to believe in Jace Clayton's observation about music streaming services — "We're inside the infinite library! Let's start showing a sense of wonder and respect!" One casualty of mostly listening to streaming music is that I don't have a coherent mental model for what my collection of music "looks like" at any given time, because it's distributed across several proprietary services. When I was downloading a lot of music, I could pretty easily get a sense of what I was listening to at a given time by sorting the music (in iTunes) by "Date Added". the totality of 2017's downloads — not a lot! Though in principle YouTube or Spotify or Bandcamp maintains a record of everything you've listened to over time, these representations are often lossy. What are the odds that my YouTube history will be persist in 5 or 10 years? What merits counting something as part of my listening history, vs. something I've merely sampled or briefly listened to? In 2017 I started more methodically saving songs I was streaming & feeling to a tag on my bookmarking account. Though this system is imperfect as well (sometimes I forget to bookmark something I'm listening to a lot!) it felt like a nice balance between allowing for the free-wheeling nature of streaming random music on the internet, while still having some permanent record of "what I listened to, regardless of the platform, for a given time period". As an exercise in trying to digest this year's personal favorites, I made an mp3 collage of some of the ones that hit me the hardest. It's mostly in reverse-chronological order, and I was trying to record this like how you'd record songs from the radio for a tape: the timing for when I'd start & stop are at the mercy of someone else's controls. If you've ever played the role "YouTube DJ", you'll know what this feels like: there's a very specific ergonomics to streaming music that's distinct from playing mp3's or records. Praise be to the original uploaders, and everyone who shared music with me this year — please send me your "ones"!